Moody’s, the US ratings agency, has stripped Spain of its A status, making it harder for the government and banks to borrow money, despite recent bail-out plans. 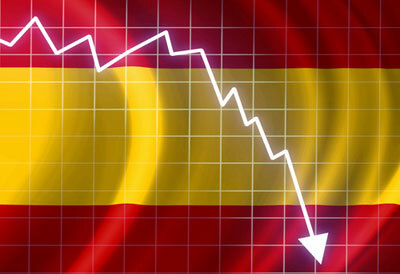 Moody’s downgraded Spain from A3 to Baa3 – one notch above so-called ‘junk status’ where investors are no longer guaranteed a safe repayment on the bonds. It also warned it may soon further downgrade the eurozone country. The downgrade means that the government’s borrowing costs – already close to bail-out territory – will rise even higher. The interest rate on Spain’s benchmark 10-year bonds rose as much as 25 basis points to a euro-era high of 7.02%, breaching the level that triggered a collapse in confidence in Portugal, Ireland and Greece. The Danish presidency has abandoned attempts to agree new rules on access to EU documents. It took the decision on Tuesday after EU countries and the European Commission last week rejected its latest draft of the law. It still wants MEPs to back a commission proposal to extend existing rules on freedom of information to all EU institutions – including its 31 agencies. The existing rules go back to 2001. Pro-transparency advocates say they allow too much secrecy. EU officials say they waste time by ambiguity on what is open or not. The WWF has said the EU’s latest fisheries agreement should be a source of embarrassment at the Rio summit next week. “I don’t know how the EU can defend their position in front of the world community at Rio … On one side they talk of sustainable capacity but on the other they commit illegal fishing practices on a global scale,” Roberto Ferrigno, the WWF’s expert on EU fishing policy has said. Minsters of agriculture earlier the same day – following 18 hours of tense negotiations – agreed to limit over-fishing of main species by 2015 and of bycatch species by 2020. European Commission President Jose Manuel Barroso has said member states must agree to a big common budget, a future banking union and – ultimately – political union in order to save the EU. His speech at the European Parliament in Strasbourg on Wednesday comes before an EU summit on 28 June. Barroso, EU Council president Herman Van Rompuy, European Central Bank chief Mario Draghi and Jean-Claude Juncker – the head of the euro-using countries’ club, the Eurogroup – are drafting a joint paper on how EU leaders can stop the crisis. The text will be a political manifesto rather than a legal proposal, officials say. The EU will beef up its foreign affairs team by hiring a Special Representative for Human Rights (EUSR), according to EU foreign affairs chief Catherine Ashton. The envoy is to represent the EU in international discussions and be expected to engage with the UN, to chair high-level human rights dialogues and to lead consultations with third countries on human rights issues, the committee says. World leaders should not “overestimate” Germany’s ability to resolve the eurozone debt crisis, Chancellor Angela Merkel has said. She told Germany’s parliament that the country’s options for rescuing the eurozone were “not unlimited”. Mrs Merkel called for more regulatory powers for the European Central Bank, and repeated that growth should not be financed by more debt. Her speech came ahead of a meeting of G20 nations in Mexico this weekend. Germany has been central in driving changes within the eurozone and backing the financial support given to debt-laden nations. Clashes between rival Russian and Polish football fans in the Polish capital Warsaw have marred a Euro 2012 tie between the two teams. A march ahead of the match by thousands of Russian fans to mark their national day had to be halted and some missiles were thrown. A heavy police presence was in evidence around the stadium after the match as further clashes broke out. About 6,000 police were on duty to keep the rival fans apart. A heated debate has arisen in Russia over the fate of Lenin’s body, after the new culture minister, Vladimir Medinsky, told the radio station Ekho Moskvy that Lenin should be buried. “A body should be interred in the earth” Medinsky said, who added that he was in favour of making it a state occasion. “I would observe all the appropriate ceremonies. As [Lenin] was a senior public figure the funeral should happen with all fitting state rituals, distinctions and a military salute in a suitable place.” Berlin police have released a photograph of a mystery boy who claims to have spent five years living in a German forest, in the hope of establishing his identity. The teenager, who has been nicknamed the “forest boy”, was discovered nine months ago when he turned up at Berlin’s town hall carrying a rucksack and tent and saying he had walked for five days to get to Berlin. Calling himself Ray, he said both his parents were dead. Police are now hoping their international appeal for information will help to identify him, saying they have doubts about many aspects of his story.